How would like to make your DIY projects like a magic mirror or a computer controlled submarine? While you could make these with Arduino, Onion has come up with a better and cheaper alternative which runs on Linux. 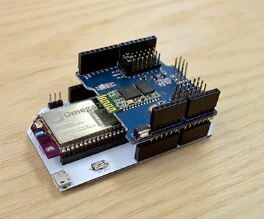 The Onion Omega2 is an Arduino-compatible board which runs Linux natively. This means you can plug it in and get a command line or access the system via a desktop-like web interface. It has Wi-Fi built in and can be expanded to support cellular, Bluetooth, and GPS connections. Omega2 is a collective effort of thirteen artists, engineers and makers based in Boston, Toronto and Shenzhen. When trying to build a small thermal printer the team was disappointed at the difficulty and lack of tools available to create new hardware. Their solution was the Onion board, a small development board based on Linux and including wifi connectivity – that project was crowdfunded in 2015. Based on consumer feedback and process improvements Onion is back on Kickstarter with the Onion Omega2, a $5 Linux computer designed for the Internet of Things. The Omega2 works with wifi and flash storage to be usable immediately out of the box. Another advantage Omega2 has is its community, where users are encouraged to upload and share their projects, apps and ideas for everyone to use. Omega2 supports Python, Node.js, Perl, Ruby, C++, Lua, php, and BASH, and Node-RED is identified as a tool for beginners to start their Internet of Things applications. The unit itself costs $5 on Kickstarter and will ship in November 2016. Onion team has also made a plus model 128MB RAM and 32MB storage which will be available for $9. Docks to connect the device to power and storage cost about $15. You can even add an OLED screen to check it out.